CyberLink has released its $59.99 PhotoDirector 5 Deluxe, a new version in the PhotoDirector family designed "to satisfy the needs of home users and casual users." Despite that modest ambition, the photo editing package includes some sophisticated tools, including content-aware removal, people beautifier tools, HDR effect and photo presets. Global Adjustments. Make non-destructive manual adjustments or apply presets. DirectorZone. Download more presets, too. CyberLink has posted a Comparison page to highlight the features in each PhotoDirector version. More information is in the news release below. TAIPEI, Taiwan -- CyberLink Corp., a provider of innovative media creativity solutions, has launched PhotoDirector 5 Deluxe -- the new version in the award-winning PhotoDirector family -- available at $59.99. Designed to satisfy the needs of home users and casual users, PhotoDirector 5 Deluxe is packed with the most popular photo editing tools, which allows users to easily create pro-quality family photos. 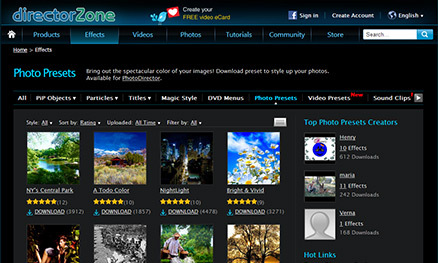 "PhotoDirector has received numerous international awards since its first version in 2011. The new Deluxe version of PhotoDirector is designed to satisfy the versatile needs of today's home users"
To satisfy the versatile needs of home and casual users, PhotoDirector 5 Deluxe is packed with various easy-to-use photo editing features from the PhotoDirector family, including content-aware removal, people beautifier tools, HDR effect and tons of photo presets. 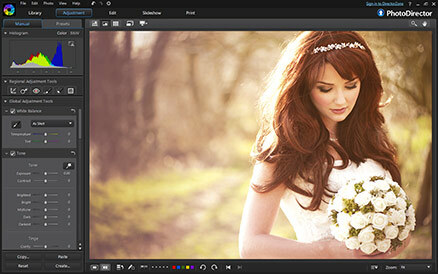 PhotoDirector 5 Deluxe integrates photo management, adjustment, editing and sharing into one intuitive workflow. "PhotoDirector has received numerous international awards since its first version in 2011. The new Deluxe version of PhotoDirector is designed to satisfy the versatile needs of today's home users," said Alice H. Chang, CEO of CyberLink. "PhotoDirector 5 Deluxe is packed with the most popular features of the PhotoDirector family, but comes with just half the price of its professional counterparts. With intuitive workflow design and easy-to-use tools, home users can easily create high-quality stunning family photos without professional photo editing techniques." Powerful Photo Adjustment -- All the tools you need to intuitively adjust image tonality, white balance, HSL and saturation. Smart Photo Editing -- Over 30 powerful editing tools, including the advanced Content-Aware Removal to automatically remove unwanted objects from photos and intelligently fill in the background area. Flawless Portrait Photos -- Comprehensive range of People Beautifier tools to contour bodies, smooth skin, remove wrinkles and make eyes sparkle. Easy Photo Management -- Intuitively manage, adjust, edit and export photos -- all in one photography workflow. Innovative Face Tag technology helps users to easily organize photos with faces. High-Quality Productions -- Produce high-quality HD slide shows, customize photos with watermarks or photo frames and share on Flickr and Facebook. PhotoDirector 5 Deluxe is available today and can be downloaded from the CyberLink online store. PhotoDirector 5 is available in the following languages: English, French, German, Italian, Spanish, Chinese (Simplified and Traditional), Japanese, Dutch and Korean.